Our audience is your audience…and we want to help you reach them! This year, Dancing With The Teachers is a TWO-NIGHT EVENT. Join us as an ADVERTISING SPONSOR as we celebrate our 5th DWTT Season. We look to our community to support us in a number of ways, and advertising in our playbill is one of them. Our playbill will be in the hands of over 1,200 people, so it is a great opportunity to show your support for a great cause and gain many supporters of your own at the same time! 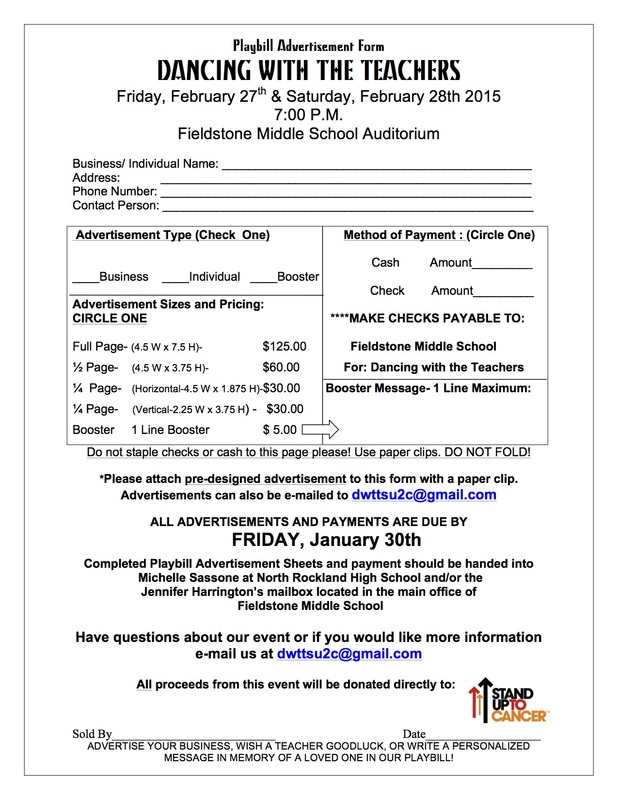 Business Advertisements: Advertising your business in our 2015 Dancing With The Teachers Playbill is a great way to reach potential customers while supporting a great cause. Our playbill provides your business direct access to a diverse audience who shop and dine in our community on a regular basis. 100% of the proceeds of our event (playbill included) will be donated to Stand Up To Cancer. In addition, your business name will recognized and listed on our website. Personal/Individual Advertisements: Whether it is say good-luck to a cast member or honor a loved one who has been affected by cancer, taking out an Individual Advertisement in our Playbill is the perfect way to show your support. If you would like more information, please e-mail us at dwttsu2c@gmail.com.